What do rabbits eat? Rabbits eat plants. They are herbivores. They don’t eat meat. In the dead of winter, they’ve been known rarely to scavenge carrion during scarce times. Our domestic rabbits are nothing more than the 'cottontails' - the wild rabbits - of Europe. They forage just like their American cousins do. What do rabbits eat today? Wild rabbits don’t get the convenience of a commercial pellet feed, but our domesticated rabbits that live with us can definitely benefit from the complete nutrition offered in commercial rabbit pellets. Feed your rabbit an amount of rabbit pellets appropriate for its weight, along with free-fed grass hays (timothy, orchard, oat). Fresh, raw, organic (pesticide-free) vegetables can also make up part of the rabbit's rations, if you like. Go really easy on fruits as treats. Rabbits like to chew a lot. They'll appreciate it if you give them a piece of wood or untreated plywood to chew on. It might help keep them from chewing on your furniture, electrical cords and phone wires. They don’t usually realize those items aren’t on the menu. What do rabbits eat, especially PET rabbits? A pelleted rabbit feed such as Sherwood Forest brand feed is ideal for pet rabbits. It is formulated two ways, to meet the needs of both bunnies and adult rabbits. Weanling bunnies and youngsters up to adulthood can be free-fed pellets and alfalfa hay. If you plan to supplement rabbit pellets with fresh raw veggies, 12 weeks old is a good age at which you could start doing so. Go easy at first. Bunnies still maintain a delicate balance between good bacteria and dangerous ones at 12 weeks. Too much fresh stuff at first may give your rabbit a case of the trots, which can be fatal. 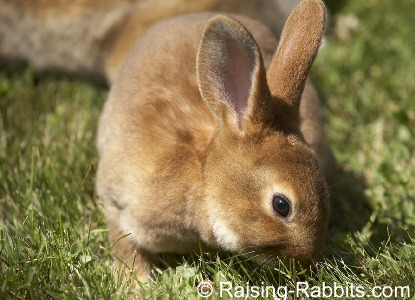 If your rabbit’s droppings start getting loose, back off the fresh green stuff for a while. Very sweet fruits like bananas and apples should be avoided or fed only tiny amounts as a very special treat. Therefore, if you're lucky enough to purchase a youngster as a pet that has been eating green forages for weeks already, this is a practice you can continue, if you like. Be sure to inquire from the breeder as to what foods the bunny had been eating, and request any feeding guidelines the breeder would recommend going forward. Bunnies that have been on fresh forages usually transition handily to pethood. 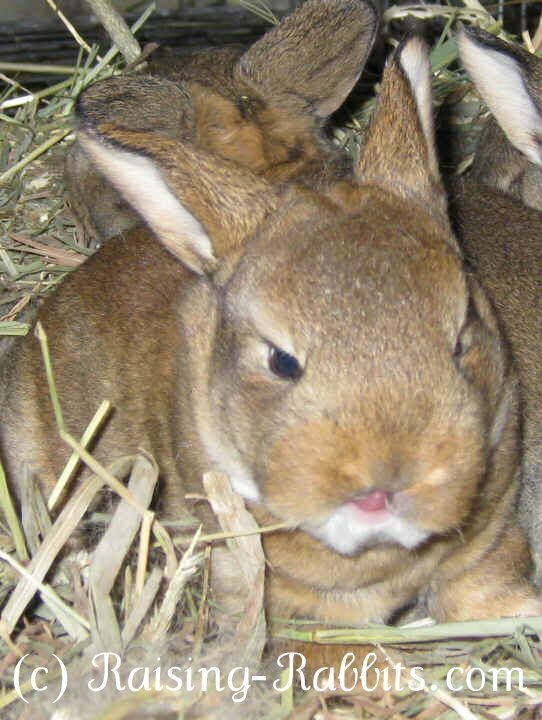 Young adult rabbits should receive approximately 1 ounce of pellets per pound (of rabbit) daily, plus sufficient timothy, orchard or oat hay for the rabbit to eat at will. The idea is for the rabbit to maintain its ideal adult weight while being sufficiently nourished. My 8-pound Rex rabbits get roughly 8 ounces of pelleted feed daily. Rabbit pellets are usually a complete rabbit feed. The only remaining nutritional need for the rabbit is fiber. Timothy and grass hays provide a LOT of fiber and a small amount of nutrition, while alfalfa hay is very high in protein and other minerals and nutrients, along with fiber. If you only have access to alfalfa for your pet rabbit, feel free to feed it, but you might then cut the pellet ration in half. Your pet's weight and conditioning is what will guide the amounts you feed. If you choose to feed people-food, you can increase your rabbit’s intake of veggies at adulthood - up to a cup a day. If so, you can cut the pellet ration by 1/3 to 1/2, always aiming to maintain the rabbit's weight at the ideal and ensure optimal nutrition and immune system health. Rabbit pellets are designed as a complete feed. Nothing says you must feed anything other than pellets and hay. Don't forget - rabbits are rabbits. They are not people. They don't think like people. They show no signs of being dissatisfied with their pellets-and-hay diets. In fact, that's way better than they could hope to find in the wild, as long as the pellets are fresh. Have you heard that you shouldn't feed alfalfa hay to adult rabbits? For a pet rabbit, don't be afraid to give alfalfa, but don't free-feed it either, as the rabbit may gain excess weight if it is not very active. Rabbits have excellent calcium-excreting mechanisms, as evidenced by the opaque solids in their pee. This is NORMAL, and not a problem. Alfalfa under normal circumstances poses no problems. In the wild, rabbits usually fall victim to predation by age 18 months, on average. Only pet rabbits get the (unnatural) chance to live to 10 years old. As your pet rabbit ages, your rabbit-savvy vet will be able to monitor your rabbit's kidney function, and advise you about the wisdom of feeding alfalfa. Important caveat: Feed only non-GMO alfalfa to avoid serious health challenges. Mature adult rabbits can be expected to eat a bit less than they did in their earlier prime. If you find the rabbit is leaving food behind, then don't feed it as much the next day. This suggestion presupposes the rabbit is otherwise active and healthy, of course. Always provide a handful of grass hay every day. Go easy on the treats, especially on fruits - a couple teaspoons per day at most. Old rabbits over 6 years old should be fed as mature adults as long as their weight stays constant. If your old rabbit starts losing weight, increase the amount of pellets a bit. What do Rabbits Eat -- if overweight? No More Treats! Especially not fruits. Reward your rabbit with chew toys rather than with food. What do rabbits eat if raised for show? The breeders of show rabbits typically follow a feeding protocol aimed at maintaining rabbits well-conditioned and in the peak of health, but not overweight. This frequently involves feeding a commercial pellet almost (but not quite) exclusively, with the rations topped off with a teaspoon or so of a conditioning formula intended to keep the rabbit in peak health, its coat glossy and healthy, and its flesh well toned. Our Conditioning Rabbits for Show page holds valuable feeding and conditioning information for owners of not only show rabbits, but also meat rabbits and pet rabbits.